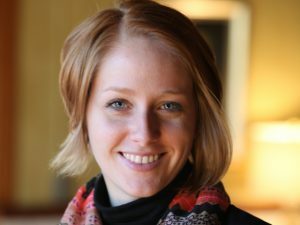 Finnish Innovation: Happy or Not? red frown on the right. I immediately knew what to do. This was my chance to rate my experience going through airport security. home-base of Tampere, Finland. According to the Embassy of Finland, the device has been quickly adopted not only in Finland, but internationally. It’s helping companies like IKEA®, Domino’s Pizza® and GE Healthcare® evaluate how their service is impacting customers, happy or not. Of course, this got me thinking: How could my clients use this handy little device to take the pulse of their customers? Retail: A retail location is a no-brainer. Place a device at the exit and ask ‘How would you rate your service today?’ Use the data to track trends; are their times of the day when satisfaction is at its highest or lowest? What is happening during that time? Who is working? Is it a peak time or a slow time? Mood-changing services: A great application would be services where the experience is intended to make a change to the customer’s mood such as gyms, spas and massage services. 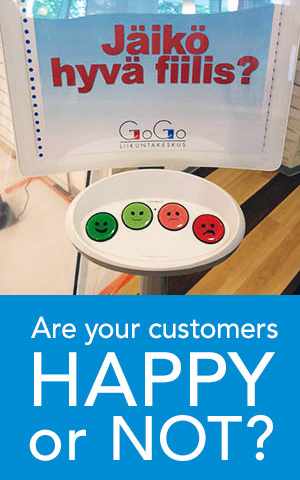 Place one device each at the entrance and exit and ask a simple question: ‘How are you feeling today?’ You’ll be able to see how your customer’s mood changes between the start and end of your service. Workshops and events: Get immediate feedback about your workshop session or event with the device and a simple sign: ‘Rate today’s training.’ Then follow up with an email survey for more in-depth feedback. With ever great innovation there can be a ‘shadow side.’ Using a device like HappyOrNot will show you trends in the satisfaction of your customers, give you an overall picture of how your customers are feeling and help you narrow down the times of day you should focus extra attention on building a more positive customer experience, but it can’t tell you why. Why are customers happy with your service at 10:00 am but angry at 2:00 pm? What changed? Or, how do I fix a consistently poor service experience? That’s where a customer service design comes in. Ask us about it, we’re here to help.